We are kicking Big Polluters out of climate policy. 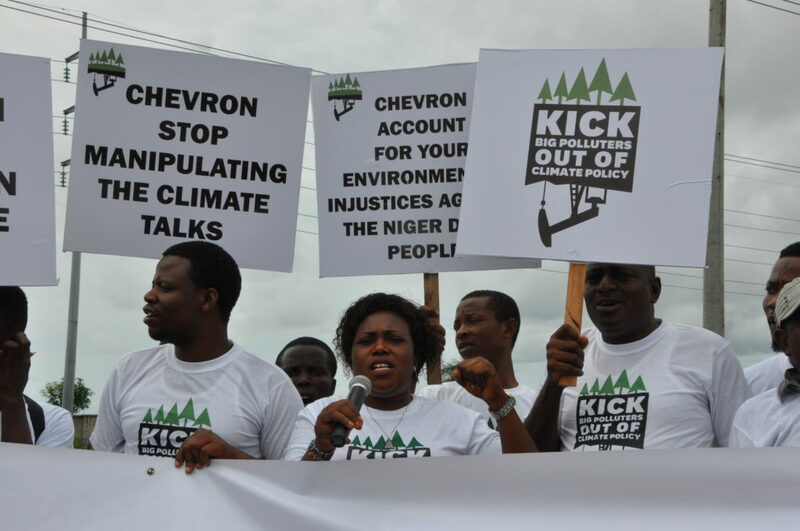 We partner with allies like Environmental Rights Action, Nigeria to challenge Big Polluters’ destructive influence in climate policy. Catastrophic hurricanes and typhoons. Drought and famine. Entire countries being swallowed by the ocean as sea levels rise. This is not the scene of a dystopian future. Climate change is not a future threat — it is here now. People are dying and communities are being destroyed. But the effects of climate change — just like the causes of climate change — are not equally distributed. The people and communities who are experiencing the most devastating impacts of climate change right now are those who have contributed the least to the problem. The twin histories of systemic racism and U.S. imperialism means that Global South countries and communities of color in the U.S. are on the frontlines of climate change. They are also on the frontlines of developing policies, solutions, and tools to adapt to the changing climate and to move quickly to alternative energy sources. In the meantime, just 100 fossil fuel producers are responsible for 71 percent of global greenhouse gas emissions. These transnational corporations, based in the Global North, are doing everything in their power to continue polluting and extracting. For more than twenty years Big Polluters and their industry trade groups have been watering down promising policies, promoting half-measures, and pushing false solutions. They fund junk science to sow doubt and confusion about the reality of climate change. And they fund politicians who stonewall climate policy for them. During the 2016 U.S. election cycle alone, the oil and gas industry spent more than $117 million lobbying and more than $100 million in political contributions. Between 1998 and 2012, Exxon Mobil donated more than $27 million to institutions and think tanks that have since produced research discrediting and questioning the science of climate change. In the lead-up to a significant U.N. climate treaty meeting in 2015, eight oil and gas corporations reported holding 143 meetings with European government representatives. Indeed, the corporate capture of climate policy can be seen most clearly in the U.N. climate treaty (formally known as United Nations Framework Convention on Climate Change, or UNFCCC). Our climate campaign seeks climate justice by kicking Big Polluters out of the international, national, and local climate policy, and the U.N. climate treaty is where we start. The U.N. climate treaty entered into force in 1994. At that time, the global community recognized the need to act quickly to reduce greenhouse gas emissions. They came together to ratify a treaty that had the potential to provide a powerful call for all countries to set strong national climate policy. But from the beginning, the fossil fuel industry and other Big Polluters inserted themselves into these treaty talks and successfully delayed, weakened, and blocked climate policy at every level. More than two decades later in 2015, governments came together in an attempt to forge new commitments on climate — adopting what became known as the Paris agreement. And Big Polluters were there too, trying to exert their influence over the process. Transnational corporations with ties to coal and gas sponsored the negotiations and promoted false solutions at a giant expo in Paris. Corporations like Exxon Mobil, BP, and Shell tried gain legitimacy for their voluntary commitments in this process. And Global North countries representing Big Polluters interests pushed for an agreement that would have less force. Today, even as Donald Trump has declared the U.S. withdrawal from the Paris agreement, the U.S. delegation remains involved in talks about how to implement the Paris deal. It is not acting as a good faith negotiator; it is there to stall progress and push the interests of the fossil fuel industry. That’s why we’re demanding the U.S. listen to the people’s will and get on board with climate action — or get out of the way. Take action. Our climate campaign also holds Big Polluters accountable. As part of the #ExxonKnew coalition, we are demanding accountability for Exxon Mobil for its climate crimes. Exxon Mobil knew about climate change half a century ago. It deceived the public , misled shareholders, and robbed humanity of a generation’s worth of time to reverse climate change. Massachusetts Attorney General Maura Healey is leading the way in her hard-hitting investigation into the corporation. Through grassroots mobilization, we stand behind her as she faces multiple industry lawsuits and attacks by Representative Lamar Smith — chair of the House Committee on Science, Space, and Technology, who has a long-standing allegiance to the fossil fuel industry. And we are calling on California Attorney General Xavier Becerra to launch an investigation as well. When Gov. Jerry Brown announced Becerra as his pick for attorney general, he specifically highlighted the importance of climate, saying “I’m confident he will be a champion for all Californians and help our state aggressively combat climate change.” And the Los Angeles Times reported that former California Attorney General Kamala Harris was starting to investigate Exxon Mobile before she became a U.S. senator. In early 2017, 18 of California’s delegates to the U.S. House of Representatives wrote to Attorney General Becerra to ask him to continue Kamala Harris’s investigation into Exxon Mobil. You can amplify their call and let the attorney general know that Californians across the state demand climate accountability. Our climate campaign builds on the major victories of our precedent-setting tobacco campaign. In the early 2000s, Corporate Accountability partnered closely with people, allied organizations, and governments around the world to take on another behemoth industry — Big Tobacco — in the U.N. policymaking forum. Together, we secured a strong global tobacco treaty that explicitly prohibits tobacco corporations from playing any role in setting public health policy–a treaty that has since spurred the passage of lifesaving public health protections around the world. The world came together to agree: Big Tobacco’s interest is in fundamental conflict with the objectives of setting public health policy. It should simply not be allowed to sit at the policymaking table. It’s the same with Big Polluters and climate policy. Right now, Big Polluters are practically running the show — but they shouldn’t even be in the show. Securing bold, effective climate policy means kicking Big Polluters out. During the global tobacco treaty negotiations, the U.S. proved to be an enormous obstructive force in securing a powerful, binding treaty. Only by organizing shoulder to shoulder with Global South allies and champion governments, and by fearlessly calling out the U.S. government’s role, were we able to move the treaty forward. In so doing, we secured a precedent-setting international law on which our climate campaign is built. We partner with organizations around the world to kick Big Polluters out and advance climate, environmental, and racial justice. Read more about our approach to organizing with allies. After Trump, an outspoken denier of climate change, got elected to office, we helped ensure thousands of people took to the streets for the People’s Climate Movement events in April 2017. Big Polluters can no longer influence U.N. climate treaty talks unnoticed. Our relentless campaign to expose their influence over climate policy put this issue on the front page of The New York Times, as well as in countless other media outlets such as Democracy Now! The reports we released in collaboration with our Global South allies have been critical to securing such media coverage and shaping the conversations at the treaty talks. During the treaty meetings in 2016 and 2017 for example, governments and people from around the world demanded that climate policy be protected from Big Polluters. With every meeting, we are ensuring the demand for climate policy that serves people and the planet – not the corporate bottom line—grows ever louder and stronger. In the weeks before Trump took office, we moved President Obama to take an irreversible action for climate justice — releasing half a billion dollars into the Green Climate Fund. On April 29, 2017, hundreds of thousands of people took to the streets to send a clear message: No matter who is in the White House, the people in the U.S. demand climate justice, bold action, and an end to the outsized power and influence of the fossil fuel industry. Corporate Accountability was central to the organizing of events in places like Boston and San Francisco. Sign the petition calling on your government representatives to take back climate policy from corporate capture. 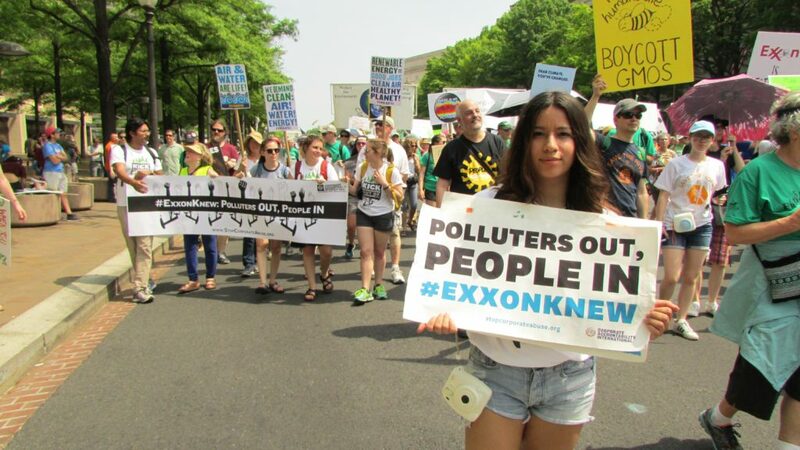 If you are a public official and want to take action to get the fossil fuel industry out of climate policy, contact us at info@CorporateAccountability.org. Call on Attorney General Xavier Becerra to investigate Exxon Mobil’s decades of deception. If you live in Massachusetts, write a letter to the editor of your local newspaper voicing your support for Attorney General Maura Healey’s investigation into Exxon Mobil.